Despite the classic design, several of the vans are actually 21st-century re-models (gasp!). But in amongst them, 'Ruby' is still a stand out camper. A 1979, pillar box red Type 2 Danbury, Ruby is a pristine restoration with plenty of character. The family-run company is flexible, helpful and have two depots; one near the New Forest and the other on the Devon coast, near Dartmoor. While they can't promise to 'bring you sunshine', Morecambe and Wize do guarantee one seriously cool campervan for exploring North West England. 'Eric' is a classic 1971 VW Westfalia Pop Top, finished in Lotus White. The company are ideally located for exploring the Lake District and North West coast. With a wealth of campervan-friendly campsites nearby and a team bursting with local knowledge, Devoning's fleet of fully-equipped, retro dubs are the best way to soak up the South West. Their bright, colourful fleet dates from 1969 and ends with their most modern VW, circa 1986. Now that's a vintage collection! With two vans from 1971 and a third from 1970, each restored back to its former glory, Dub Dub and Away are the go-to guys in London for classic campervan hire. Their early bay VWs are cool and classic, without looking ostentatious, and decades on are as practical for camping as ever. Insurance for the first named driver and RAC cover is included on all vans. With six classic, air cooled 1970's VW campers, Isle Of Wight Campervan Holidays really do have a vintage fleet on their hands. Under new ownership since July 2014, the vans have enjoyed a winter makeover and are ready and waiting to take you on an island adventure. The folks behind SunHat France are avid camping fans, so it's no surprise to find that they're the most enthusiastic campervan business going, with two fully restored VWs from 1974 and '78. Based in Cote d’Azur, one of the jewels of the French Riviera and just 20 minutes drive from Nice Cote d’Azur Airport, they're perfectly poised for exploring the roads of southern France. Edging the city of Bath, Red Hatch Classic Campers are ideally placed for exploring the Costwolds and the South West coast. Their classic VWs are all from the 60s and 70s (but for one 21st-century replica) and have refurbished, bespoke interiors. The option of their 'all inclusive packages' mean you can turn up with nothing but a toothbrush and still be ready to hit the road! There may be some modern replicas in the fleet but, as the name suggests, RetroCampervan are all about the vintage camper look. Their 1966 pistachio green van is the oldest – popular for weddings and honeymoons – and still runs like a dream. They offer various tailored packages for special occasions. There's a good range in the Classic Camper Holidays fleet. From 1972 to 2010 models, they seem to have it all and it comes backed by the friendly and helpful service you expect from a family-run company. Located in the heart of the Scottish Borders, it's also a prime starting point for exploring Scotland. On the Derbyshire/Nottinghamshire border, The Little Blue Bay are only a few miles away from the Peak District and boast just two classic vans, both expertly restored. The small scale business is personal, helpful and extremely well priced, while the vans have been exceptionally maintained. Easy to find, O’Connors are close to Exeter, only minutes off the A30, and on the doorstep of Dartmoor and the Cornish border. Offering a choice of 15 beautiful vans (ranging from 2–6 berth), all their 1960’s and 1970’s restorations are right-hand-drive, rebuilt in their very own workshop, and all with new engines. 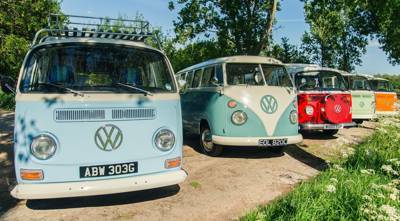 Wye Campers have a selection of beautifully restored VW splitscreens and bay window T2 campervans, available for both long and short breaks. Based on the Powys and West Midlands border (just outside the charming book town of Hay-on-Wye), they're poised for a drive to the Brecon Beacons or Forest of Dean. Expect heads to turn as you ride in WeDubYou's retro-chic vans, each finished with eye-catching paintwork. Their 'OneWay' package allows campers to road-trip from Barcelona to the vineyards of France, taking in the beautiful Pyrenees along the way, or you can just stay put in Spain and take in the local sights. Within reach of Snowdonia, the North Wales coast, the Peak District and the Lakes, Bonzer VW Camper Hire have superb vintage vans that have undergone significant renovation, bringing new life to timeless classics. While most campers feature original interiors, where that was not possible Bonzer have rebuilt them to perfectly match the original designs. Comfy Campers have gone to extraordinary lengths to maintain the original integrity of their four 1970's campers but have also carefully popped in some funky 21st century features to enhance your experience. All are classic, right-hand drive models and have been rebuilt in the Comfy Campers workshop, with new engines and restored interiors. 69 Campers have sourced their fleet from across the USA and Europe, with each van undergoing a professional, bare metal restoration and mechanical overhaul. Primed for a costal route through St Tropez, Cannes and Monaco, or a wine tasting tour of the vineyards in the backcountry of Provence, they're an ideal company for campers wanting to make the most of France. Not all of their vans are VWs but they're certainly all historic! Based in Faversham, a short drive to the Kent Downs, the Glampervan Hire Company have two classic dubs from the 70s and another from the 80s, accompanied by a range of quirky, non-VW choices. All feature gorgeous upholstery, retro cushions, bunting and lots of character. Love them or loathe them, Causeway Campers have one of the new-fangled 2012 VWs that look like the old-school classics. The engine's new, the interior (complete with kitchen, beds and pop-top roof) is new, in fact, the whole thing is pretty sparkly! But if you fancy the best looking wheels and still want modern reliability, Causeway are a top pick. Westowski Campers have just one campervan, a 1964 split-screen that will truly take you back in time. 'Poppy' has been beautifully restored and contains her original features, including seats in the back that flatten into a rock ‘n’ roll double bed, plus there are two hammock style bunks in the roof. A last cheeky entry on the list, Van Kampers are another bunch of scamps who have one of the 2010-made replica models in the classic VW style. Their Brazilian built T2 Kombi is perfect for enjoying the endless miles of the Pembrokeshire Coast and relaxing by some of the UK's best beaches.